Public interest in the supernatural happening in Boston encouraged Chris Belland, CEO of Historic Tours of America, to launch a full blown ghost tour based on the unusual occurrences, apparitions and strange legends of the city. Exclusive nighttime access to the famed Granary Burying Ground, where John Hancock, Paul Revere and Samuel Adams are buried was granted to the company leading to an increase in guests wanting to tour the city at night and assuring its place as the #1 Frightseeing Ghost Tour in Boston. Seeing the public interest in the supernatural, other cities that have a history of haunted happenings were sought out. Ghosts & Gravestones trolley ghost tours were soon opened in Savannah, Key West, San Diego, and St. Augustine, which are considered to be some of the most haunted cities in America. All city tours have seen remarkable increases in guest visitation as the notoriety of the Ghosts & Gravestones tour grows. 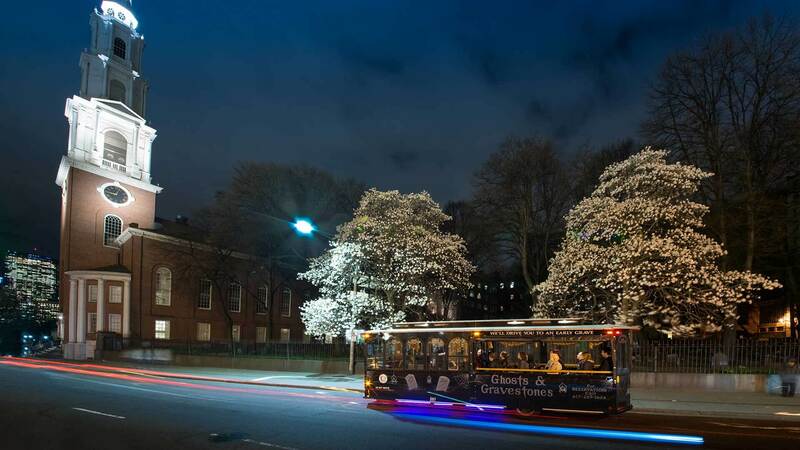 All five of the ghost tours are unique and customized to the city but with each sharing certain aspects such as the black trolleys, ghost hosts, and exclusive site visitation. Due to these unique features, the tour gained such national recognition that it has been featured on The Today Show, Sci-Fi Channel and The Travel Channel.